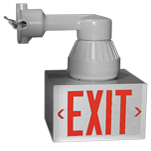 Explosion-proof exit sign is designed for hazardous locations: Class I, Division 1 & 2, Groups C and D; Class II, Division 1 & 2, Groups E, F and G; Class III. To meet code for AC/DC hazardous location EFXP exit signs that are under constant operation, a transfer panel available for up to 100W is available. Transfer panels are not designed to be installed/mounted in a hazardous or explosive area.